$195.00 Photo ID of an NKVD Special Agent, issued in Lvov Region of Western Ukraine in March 1941, just a few months before the German invasion of the Soviet Union. In very good to excellent condition. $340.00 Photo ID of a State Security Senior Lieutenant, a Section Chief with the NKVD of North Ossetia Autonomous Republic, 1943. 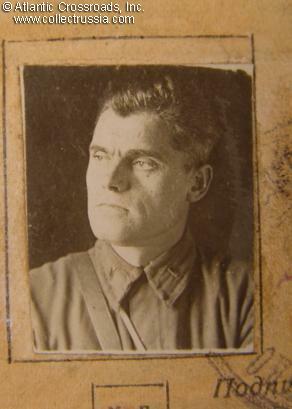 The photo shows the owner wearing a badge of Distinguished NKVD Employee on an M-43 uniform. Comes with a special free railway transportation pass from February 1941 issued to the same officer. A very interesting and uncommon set. $140.00 ID Card of an NKVD Border Guard, 1942 issue. Shows that he served as Border Guard since 1939, was promoted to Sergeant in June 1941 (just days before the German invasion) and then convicted for unspecified crimes. The ID was issued just before he was sent to the front, apparently after having his rank restored. $150.00 NKVD Transportation Department Photo ID, 1935 issue. Uncommon early ID featuring USSR State Emblem with 7 republics. In excellent condition. $160.00 NKVD employee Photo ID, issued to a female typist in the NKVD Transportation Department at the Kazan Railroad, January 1939. In very good condition. $160.00 Photo ID of a female secretary at the Moscow NKVD,	issued on 23 May 1941, just one month before the German invasion. $340.00 Photo ID of an Officer of NKGB (Nartkomat for State Security) of Kirgizia, December 1943 issue. Extremely uncommon mid-war document. $80.00 MOOP Photo ID of a Police Officer, correspondent of the newspaper	Na Strazhe Oktyabrya ("Guardian of the October [Revolution]") published by the MOOP of Belorussia. Issued in 1966. $60.00 KGB Pension Book #046945, issued to a KGB Lieutenant Colonel in 1968. In excellent condition. $395.00 Honorary Certificate issued in August 1939 to the wife of an NKVD Naval Border Guard officer	in Leningrad Region. She was given the certificate and a monetary reward for winning first prize in NKVD sports competition. Nice artwork specifically designed for NKVD: shows NKVD Internal Army trooper guarding the industrial installations and NKVD Border Guard on patrol near a border marker. In very good condition. $375.00 Honorary Certificate in Commemoration of the 20th Anniversary of NKVD Border Guards, February 1941 issue. A very ornate document featuring portrait of Stalin, Border Guard flag, and a Badge of Distinguished Employee of NKVD. Hand-signed by Lt. General Sokolov, chief of the Soviet NKVD Border Guard Directorate and one of the highest ranking NKVD commanders. This very impressive and uncommon document is in very good to excellent condition. $250.00 Honorary Certificate issued in October 1944 by an NKVD Correctional Labor Camp. Awarded for completing the assignment - laying a part of the main track of the Baikal-Amur Railroad - 82 days ahead of schedule. Unusual and colorful artwork features portraits of Stalin and Lenin and a railway train speeding through the forest. $80.00 Honorary Certificate issued by the Northwestern KGB Border Guard District to a performer of the Moscow's Maly Theater for entertaining troops, August 1971. Hand-signed by the Political Commander of the Border Guard District. A highly uncommon document in hard folder. Excellent condition. $85.00 Set of two large honorary certificates signed by Police general, 1984 and 1989 issue. Both feature an Honored MVD Employee Badge on the cover. $90.00 Lot of 2 Greetings to a high ranking Police Detective and WW2 Veteran, an Armenian national. Both are signed by Police General Patalov, Minister of Interior of Armenia. $50.00 Diploma and Transcript of the Highest MVD Officer School in Moscow, 1948. Hand-signed by the school commander, MVD Major General Anisimov.